This is a great collection of Asterix and Obelix coloring pages. 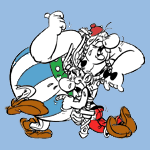 We have selected the best free Asterix and Obelix coloring pages to print out and color. They will provide hours of coloring fun for kids. Print, color and enjoy these Asterix and Obelix coloring pages! Be sure to visit many of the other cartoon coloring pages aswell. Click on the free Asterix and Obelix color page you would like to print or save to your computer.